The Single Stage Home Water Filtration is a simple and inexpensive way of removing unwanted particles from the water supply to your home. These systems do not remove bacteria and other micro-organisms that may be in the water. If the water quality in your area is a real problem, you may want to consider a more advanced filtration system, such as the Complete Home Ultra Filtration Solution. The Filters that are used for these units need to be replaced every 3 - 6 months. Minerals and pesticides are too small to be removed by the filters in this filtration unit. You will require some plumbing knowledge and experience to install the system successfully. 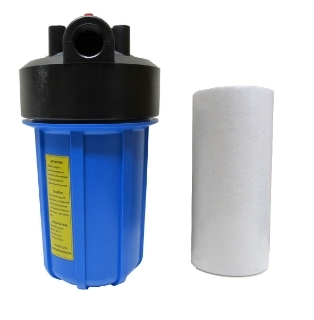 Neither of these filters removes lime (kalk), minerals or metals from the water. As a result of this, the water may remain cloudy or tinted, and may not come out crystal clear. These systems typically filter water at a peak flow rate of 2800 liters per hour. The Filter housings have a maximum operating pressure of 90 psi. If you suspect that your water pressure will at any time exceed 80 psi, a pressure regulator MUST BE INSTALLED before the filter housing. This action will guard against the water pressure exceeding the maximum pressure rating. It is recommended that the pressure regulator is set at 70 psi or less. 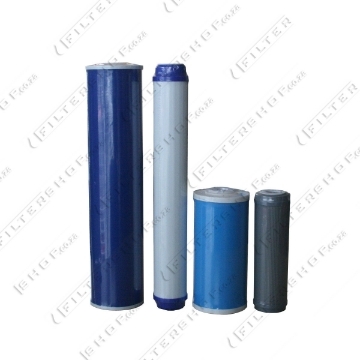 Protect the filter housing from freezing, as this can cause the housing to crack. 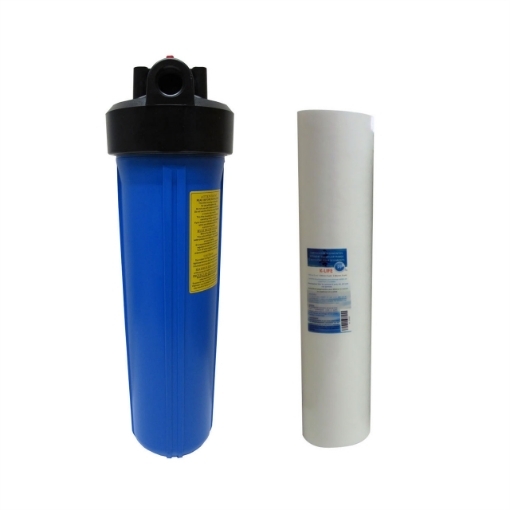 The 5-Micron Sediment Filter option is ideal if your concern is to remove dirt particles such as sand, mud, dust, and rust from the water. After filtration, the water should look crystal clear and much more appealing. 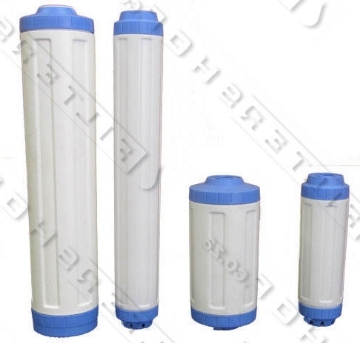 Similar to the 5-Micron Sediment Filter, the 1-Micron Sediment Filter also serves to remove dirt particles such as sand, mud, dust, and rust from the water. It filters the water through a much finer filter, thus effectively removing smaller dirt particles as well. The filter may, however, cause a reduced water flow rate due to its finer filtration process. The Activated Carbon Block Filter uses carbon technology that effectively absorbs chlorine from the water. This results in water that is healthier to drink and also tastes and smells great. Since chlorine can be absorbed through your skin and hair, it is recommended to use the filtered water for bathing and showering as well. The GAC Filter like the Activated carbon block uses carbon technology that effectively absorbs chlorine from the water. This results in water that is healthier to drink and also tastes and smells great. However, unlike the carbon block filter, the GAC's carbon is broken up into granules in order to increase the surface area for the absorption. One of the biggest advantages is that a Premium KDF filter only needs to be replaced every 24 months if normal municipal water is used. 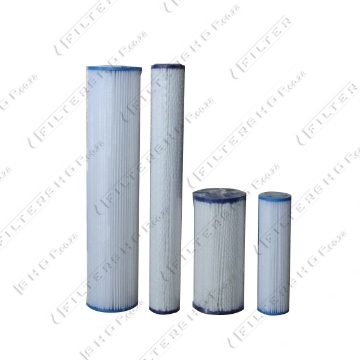 The 0.1 Micron Pleated Filter will remove very fine particles, as well as bacteria from the water. However, please note that if your water has a high level of dirt present, then we would recommend placing a coarse sediment filter before the Pleated filter in order to prevent it from blocking due to sediment. The Big Blue Housings are available with either a single O-ring seal or two o-ring seals between the housing base and lid. While both types of housings are rated for the same pressure (6 bar), the additional O-ring seal simply gives additional peace of mind against leakage from the housing. The Housing spanner helps to give you an additional "purchase" on the filter housing, making it easier to open. The Wall mounting bracket will allow you to mount the Big Blue Housing against a wall or surface. 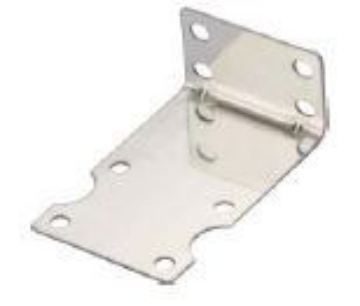 The Wall Mounting Bracket is available in either powder coated Mild Steel or Stainless Steel. However, when installed outdoors especially coastal regions the powder coated mild steel brackets can rust and perish. There is an option of upgrading the frame to Stainless Steel, which will not rust. We would especially recommend this option for those clients living at the coast (like in Cape Town, or Durban, Etc). Please note that the stainless steel brackets are typically built to order, if there is none in stock then new ones will need to be made. Lead time is typically 1 week, depending on the availability of Stainless Steel. This Option Means that the Single Big Blue Housing will come with a pre-built by-pass piping setup. The by-pass allows you to turn the water off to the big blue housing, while still being able to get water at the endpoint. Please note that the By-passes are built to order, lead time is 2 to 3 working days for construction and leak testing.